This watch is regarded by Atelier Tempus as one of the finest existing jewellery watches in the world. 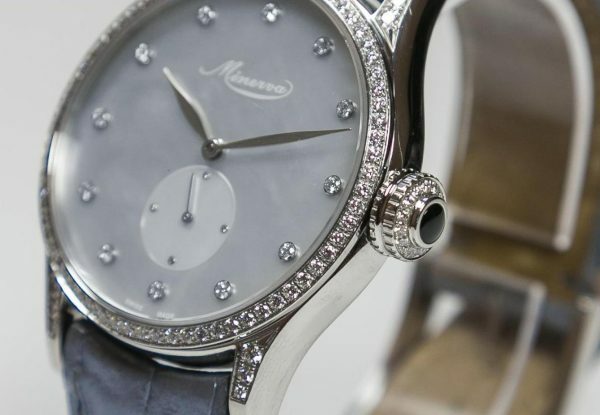 It is made exclusively with stainless steel in order to accentuate its stunning and very rich ornamentation, as well as the overall performance of the watch. 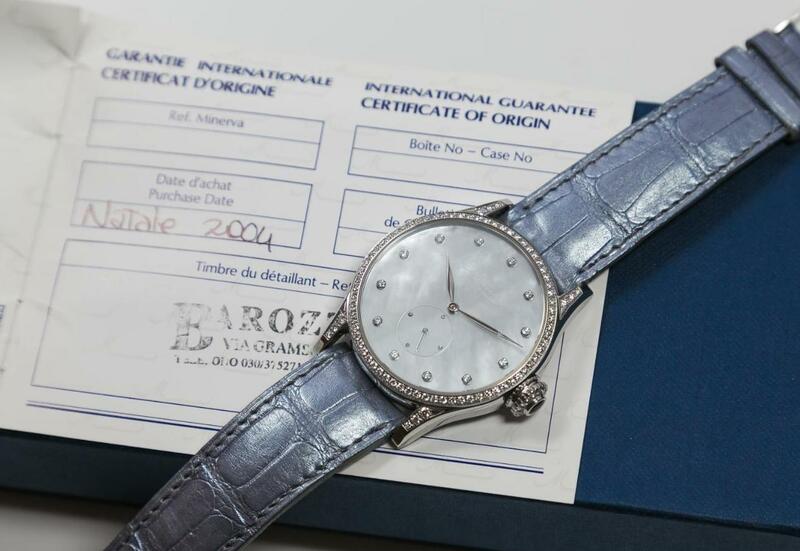 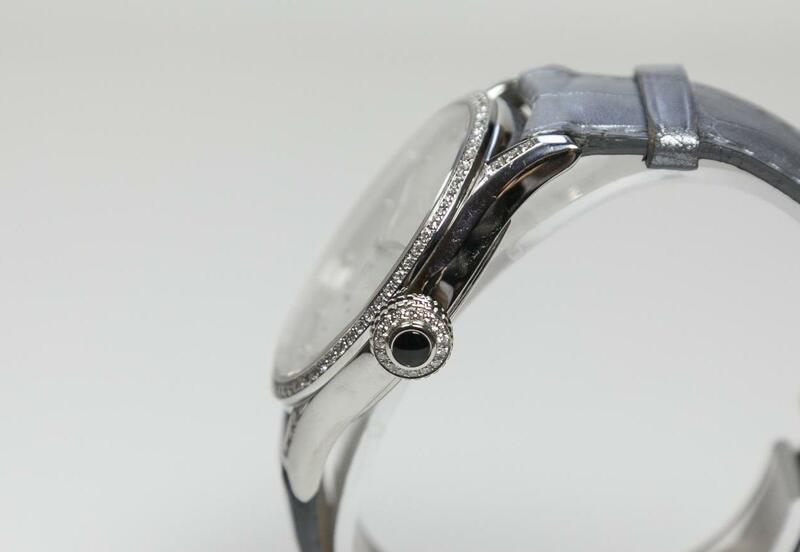 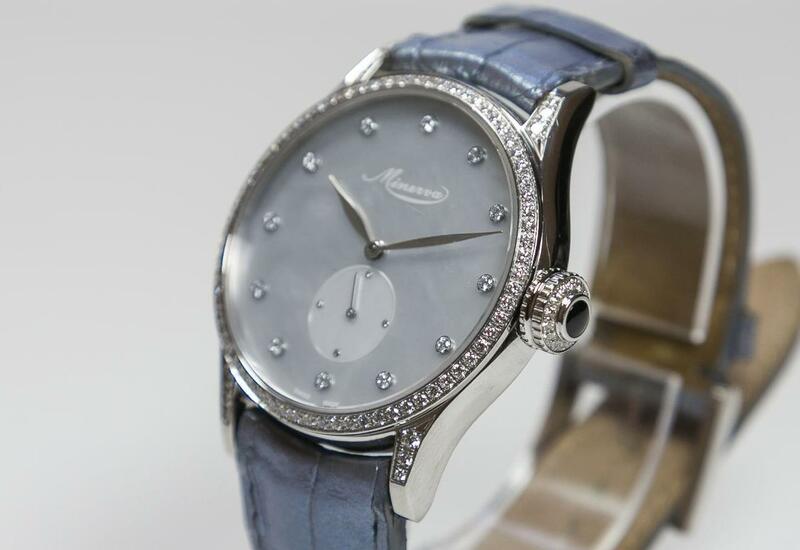 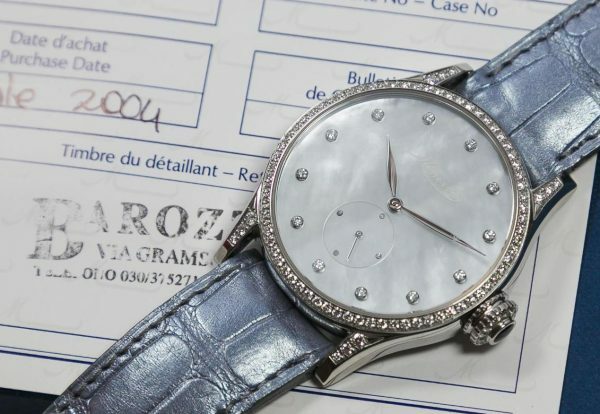 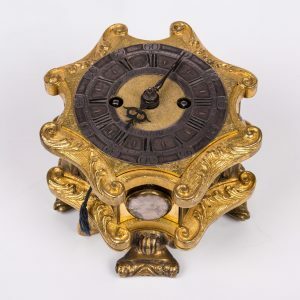 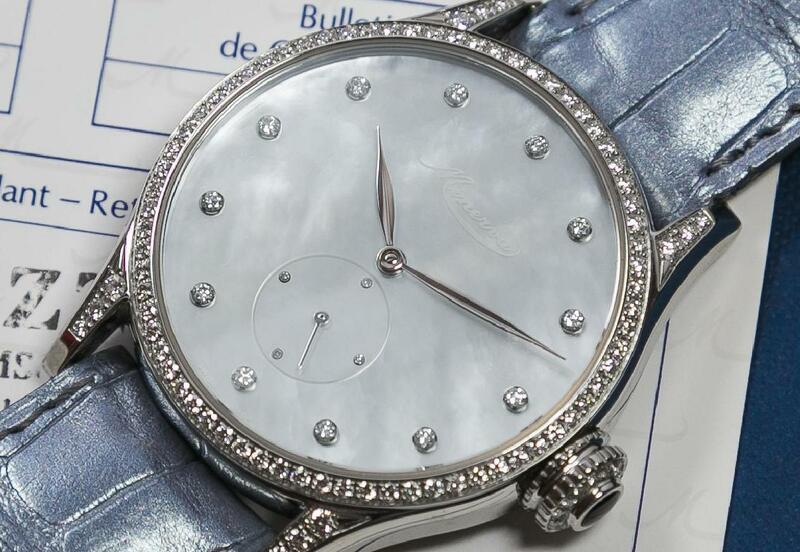 Mother-of-pearl dial, diamond numerals, housing richly inlaid with diamonds (including the crown). Case width is 38mm, which corresponds to large-size timepieces being fashionable nowadays. 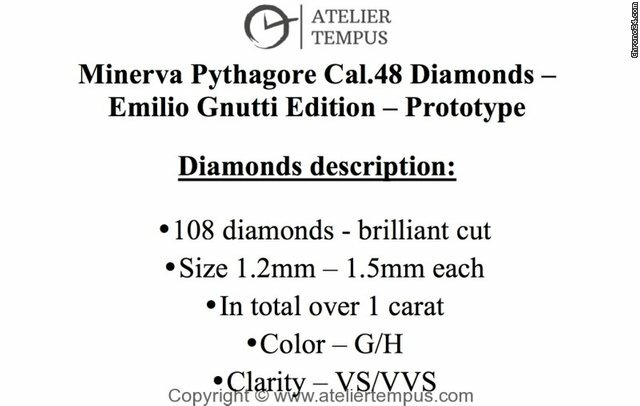 This Pythagore model was made as a special and very limited edition. 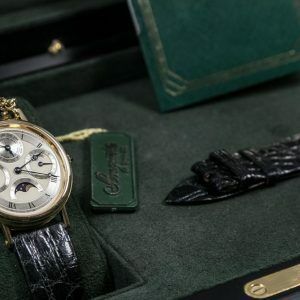 As far as we know, officially only 2 or 3 copies of this watch have ever been made due to the high cost of their production. This one was sold by the prestigious Barozzi shop, in the center of Brescia, Emilio Gnutti’s hometown, in 2004. 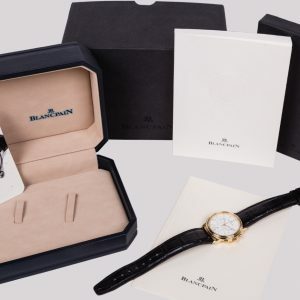 At the same time, the watch remains brand new, in mint condition, with full documentation, boxes, and of course – a strap and a clasp. 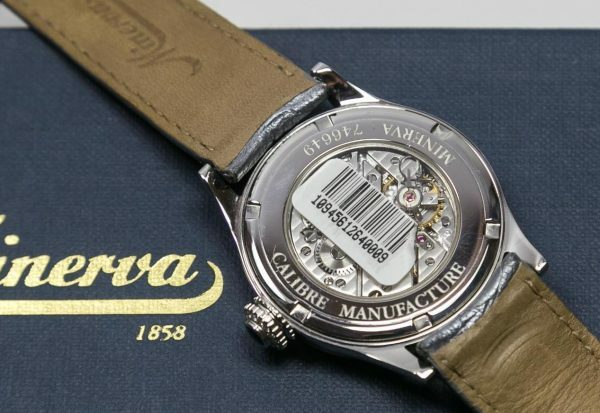 The proprietary mechanism of Cal.48 Minerva was made at the highest level of technical advancement in watchmaking, including a gooseneck and beautiful ground joints of Geneva stripes on both the surface and bridges. 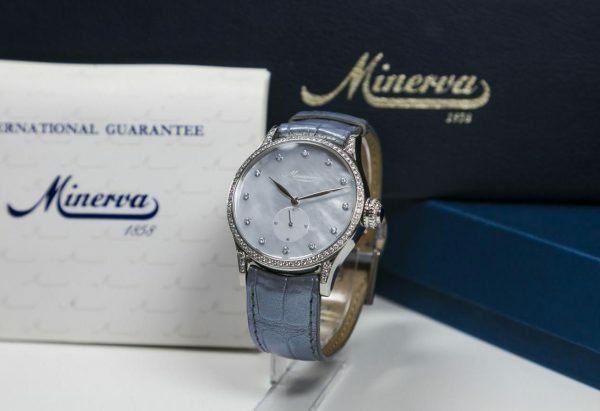 The Swiss company, Minerva, is a great watch manufactory founded back in the nineteenth century (registered under its current name in 1887). 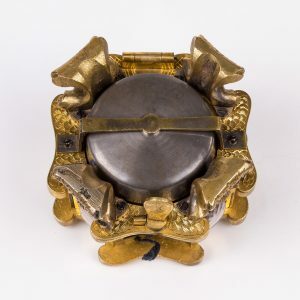 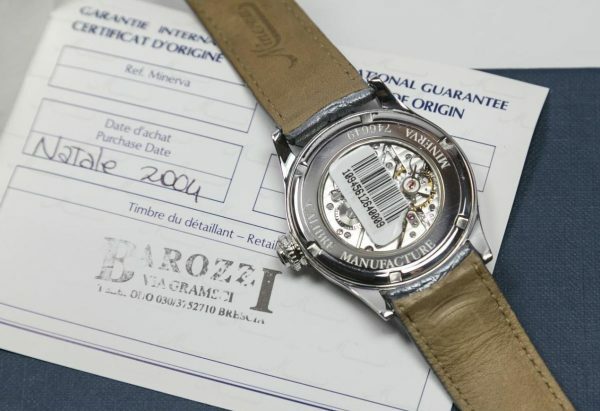 Since the beginning of the twentieth century, it has been producing its own mechanisms for pocket and wristwatches of top quality. 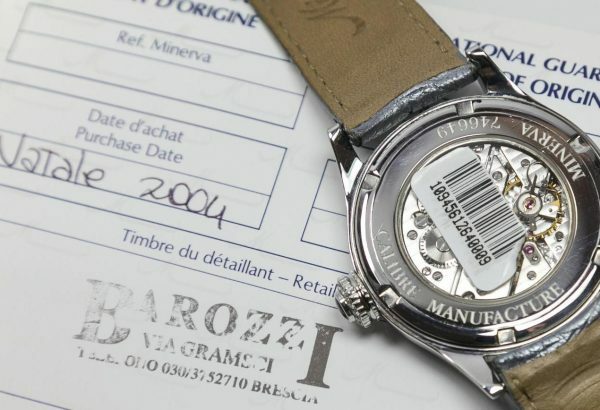 The biggest brand development within its midst occurred in 2000, when Emilio Gnutti – financier from Brescia and collector of watches and vintage vehicles – bought the manufacture from the Frey family. 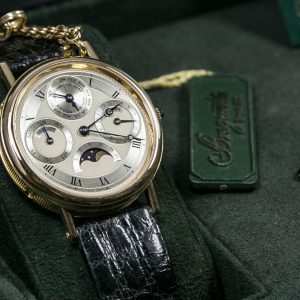 Emilio Gnutti is a reputable figure, who was one of the richest Italians at the beginning of the twenty-first century, forefronting the so-called “Gruppo Bresciano” – a group of trusted people, consisting of great entrepreneurs, designers and financiers. 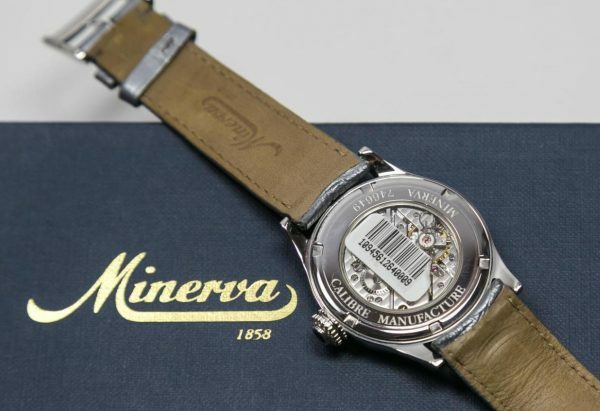 It is Emilio Gnutti who decided to transform Minvera into a manufacture of top-class watches, with their own complex mechanisms. 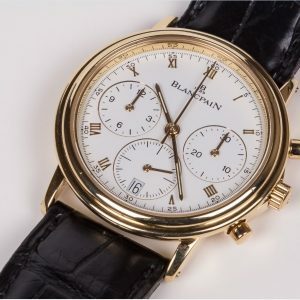 He strived to achieve what largest producers did, and, according to many, in terms of performance he managed to get to the very top. 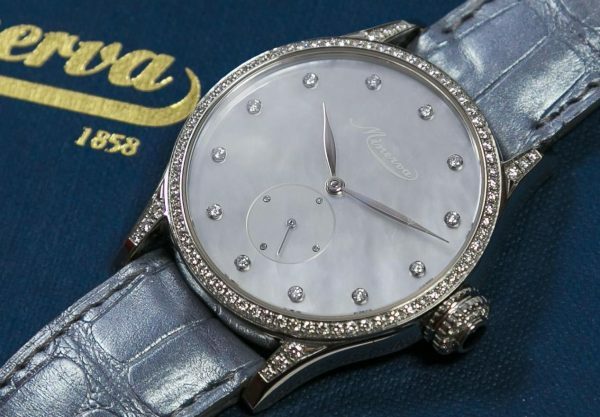 During the period under Gnutti’s management, Minerva watches have become to be consiered masterpieces, both from the mechanical and visual point of view. 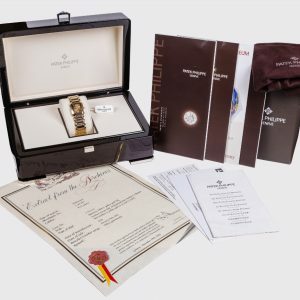 His watches were of the finest quality – sophisticated, elegant and expensive as dictated by their class. 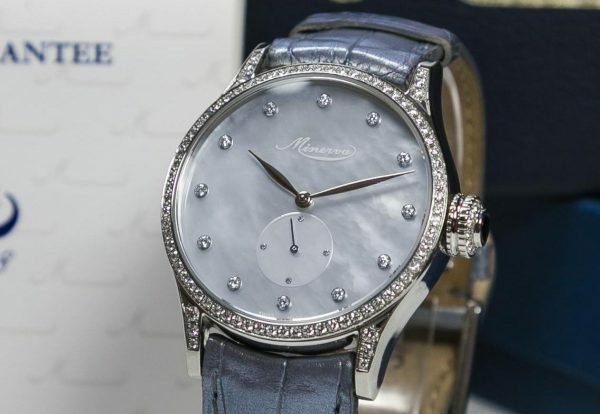 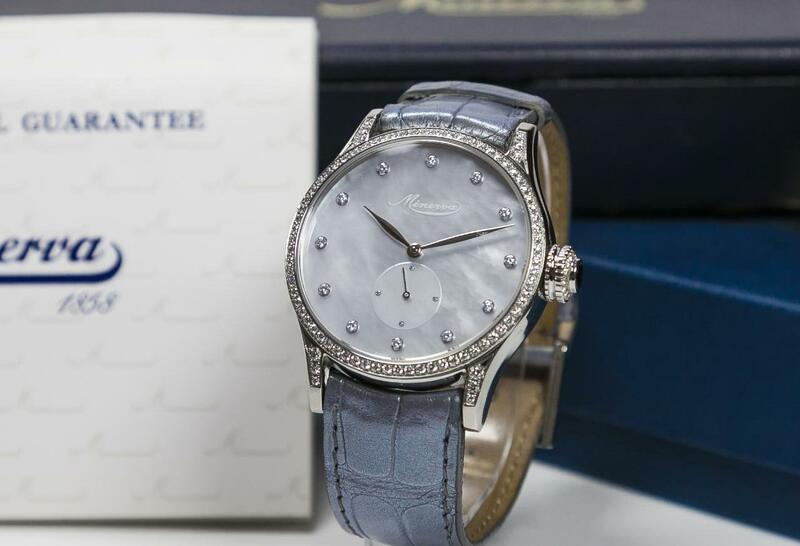 In 2006, the economic crisis thwarted plans of Minerva for further development of the brand, and, preoccupied with financial issues, Emilio Gnutti was forced to sell his beloved manufacture to the Richemont Group conglomerate. 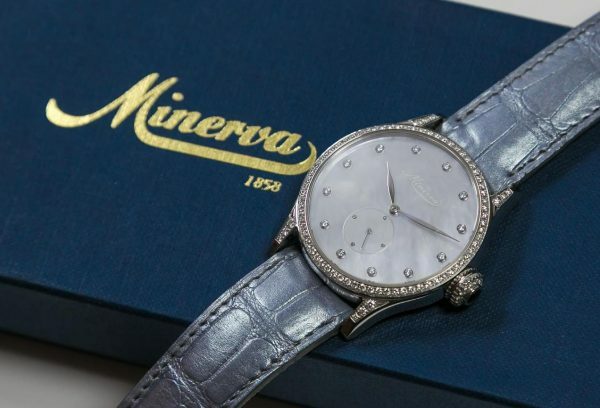 Minerva has been transformed into a subcontractor of the most complicated mechanisms for other watch manufacturers associated with Richemont Group.